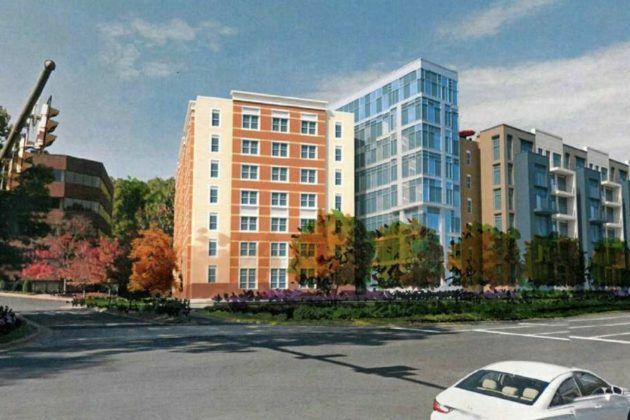 A proposal to build 145 multifamily units and offices is headed to the Fairfax County Planning Commission for approval on Thursday. An affiliate of Angelo, Gordon & Co. hopes to rezone office property to build the residential development on 4.3 acres of land on the southwest corner of Reston Parkway and Sunrise Valley Drive. A second application is under consideration by the same developer to increase the density of 9.9 acres of adjacent land as part of the same proposal. The site of the project, called Reston Corner, is currently an office park. The developer hopes to create “a new urban neighborhood” with a seven-story residential building and an 85-foot office building. The Fairfax County Fire and Rescue Department has requested $10,000 from the developer to install one traffic signal pre-emption device in order to “meet response time goals to emergency incidents,” according to a staff report. The county estimates the development will generate 16 new students. The developer will contribute $12,262 for each student. A four-level garage with a maximum height of 40 feet. The garage will be screened from view from Reston Parkway by existing office buildings and the residential project. 12 percent of the residential building will be set aside as workforce housing. The developer seeks special exception to increase density across the existing office uses. A date before the Fairfax County board of supervisors has not yet been set.